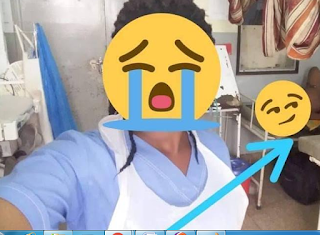 A nurse has sparked outrage among internet users following a viral picture which is making the rounds on social media for obvious reason. The yet-to-be identified nurse took a selfie in the ward of a general hospital as she also captured a Unclad pregnant woman who was laying down on a bed. The controversial picture was posted on a social media platform - causing outrage among netizens who feel it's disrespectful for the patient and unethical for the health personnel to have taken the picture with the pregnant lady in the background. A Facebook user identified as James Moses shared the picture and didn't give the exact location where it was taken as he called for the nurse's sack.